Most of us have a general awareness that there are plenty of plastic six-pack rings that wind up in the ocean. In fact, accounts of this particular form of marine litter causing harm to sea-dwelling creatures date back to the late 1970s. Since then, inventions such as photo-degradable and edible six-pack rings have been developed so that we sip a can of soda or beer without killing any sea turtles. Most recently, the plastic straw has become a hot topic of discussion. Seattle has placed a ban on these sipping devices in the wake of a very sad viral video of a struggling sea turtle…with other major cities expected to follow suit. *Warning: Video contains use of strong language. While plastic straws make up only about 2,000 tons of the ocean’s plastic waste, they serve as an effective symbol in drawing public attention to the startling magnitude of marine litter that has accumulated. A Plastic-free Ocean by 2050? The Ocean Cleanup, a non-profit organization developing exciting new technology to remove plastic from the ocean, estimates that “over 5 trillion pieces of plastic currently litter the ocean”. Dutch inventor Boylan Slat founded the Ocean Cleanup at age 18 by developing an incredibly detailed, environmentally conscious, and actually feasible plan to rid the ocean of all plastic by 2050. On their website, The Ocean Cleanup notes that, “Going after it with vessels and nets would be costly, time-consuming, labor-intensive and lead to vast amounts of carbon emission and by-catch”. They describe their solution to this as a “passive system, moving with the currents – just like the plastic – to catch it”. With great excitement and anticipation the group launched its first cleanup system into the Great Pacific Garbage Patch (a dense monstrosity of marine litter) on September 8th. 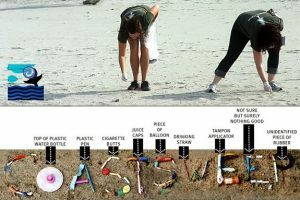 Visit www.theoceancleanup.com/milestones/ to stay up to date on their progress and see what they have planned! While large organizations continue to make progress in cleaning up our oceans, many communities are working hard to contribute on a local level. Keep Massachusetts Beautiful, a non-profit aiming to beautify the state of Massachusetts, engages local volunteers in cleaning up debris from the coastline of the Bay State with their COASTSWEEP initiative. COASTSWEEP began in 1987 and grew to over 2,000 participants last year. These volunteers removed 25,389 pounds of debris from 181 miles of waterway in places from the Boston Harbour and the North Shore all the way to Cape Cod. “If you’re like most Massachusetts residents, you probably enjoy visiting our beautiful beaches, bays, and waterfront parks”, writes Douglas Gibbons of the group. “Yet Massachusetts beaches and coastlines are under siege—not by sharks, seals, or lobsters—but by plastic pollution, cigarette butts, fishing gear, and all manner of debris that wash ashore from our cities and towns”. This emphasizes the importance of fighting the battle to attack this issue on all fronts – from the gyres where much of the trash has accumulated, to the shores where it washes back up. If you are in Massachusetts, learn how to get involved in this movement here. Dumpster Market is the first and only online marketplace for dumpster rental. We let you compare prices from local hauling companies and book a dumpster rental in Boston, MA online in minutes. Next post: Clean It Up Atlanta!